Never been a better time to save money. 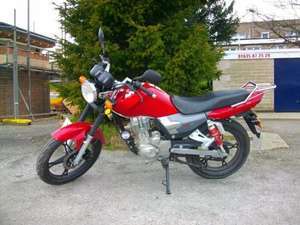 Suzuki Type Clone 125cc Good on fuel and £16 road tax. and 1,349 Clubcard points Insurance will vary depending on age. Good reviews and from Tesco an assurance if things go wrong. Bargain delivery charge of £3 most sellers charge £99! With the Motoroma SK 125cc you get an excellent retro styled commuter bike with responsive handling that is ideal for both novice and experienced riders. This red bike comes in European commuter styling, and packs a 125cc oil/air cooled 4-stroke engine to help you power your way through the traffic and is also fuel efficient. This bike comes with an electric and kick start with CDI ignition and a 5-speed constant mesh transmission system helps you get the most out of your engine. The SK 125 has cast wheels with a wavy disk front brake for maximum stopping power in case somebody is not looking properly and pulls out in front of you. Plus a 130mm drum brake on the rear wheel. This SK 125 is a sensible commuter bike that has a 12L fuel tank and will return good fuel economy with decent performance. Complies with EU directive 92/61/EU or 2002/24/EC for motorcycle type approval, and Euro 3 emissions regulation. UK specifications. No they don't, can't buy a light aircraft now that I've got my license! ... wavy disk front brake for maximum stopping power in case somebody is … ... wavy disk front brake for maximum stopping power in case somebody is not looking properly and pulls out in front of you. Oh, you didn't see the in-store bargain one in Brighton, then? 4-stroke engine is a pleasant change for a 125. Worthwhile to check out availability of spares before commiting to buy. Describing it as a Suzuki type 'clone' is a bit confusing. Most likely just cheap Chinese crap. All bolts will need replacing within a year, if they don't shred off before that time. Buy a second hand Honda, yamaha or suzuki! 4-stroke engine is a pleasant change for a 125. Worthwhile to check out … 4-stroke engine is a pleasant change for a 125. Worthwhile to check out availability of spares before commiting to buy. Describing it as a Suzuki type 'clone' is a bit confusing. These Chinese copies were based on the old Suzuki GS125 from a few years ago I had one when I first started and it was no worse than the Chinese made Honda 125 which was over 2k! My thoughts on this bike are to use it to take your test on and then sell, 2 and 3 year old examples go for £1000 to £1200 so its cheaper than having one on rental with the bike school. Obviously if you're just not cut out to be a motorcyclist and always falling off its best to have the rental package!! To be honest I would say by a 1-3 year old Honda CBF or Yamaha YBR for about that price, they will be far less likely to have corrosion and other issues, also they will hold their value, I sold my CBF for a £100 profit after owning it for 10 months, Chinese bikes tend to drop to £500 or less straight away. To be honest I would say by a 1-3 year old Honda CBF or Yamaha YBR for … To be honest I would say by a 1-3 year old Honda CBF or Yamaha YBR for about that price, they will be far less likely to have corrosion and other issues, also they will hold their value, I sold my CBF for a £100 profit after owning it for 10 months, Chinese bikes tend to drop to £500 or less straight away. if you know what you're doing and not get a thrashed to pieces s/h bike then maybe. If not these are good solid bikes that sell at good prices on eBay, just checked! Buy a second hand bike for £500 then spend the rest on learning to ride it and pass your test!!! Buy a second hand bike for £500 then spend the rest on learning to ride … Buy a second hand bike for £500 then spend the rest on learning to ride it and pass your test!!! I agree with above, buy 2nd hand for £500, £70 - £80 for cbt ,insure for a year, gain some experience and sit test with remainder. Big problem is that most usable CBF125 start second hand at this Tesco bike's asking price new. Most probably will need exhaust, tyres,chain and sprockets and front fork seals which all adds up.